Our Hip-Pack Emergency Trauma Kit is perfect for any small business, work crew or organization that needs a grab-and-go first aid solution! With contents validated by nurses, EMT's and firefighters, this medical kit includes the essential supplies you need to perform first aid in most emergency trauma situations. 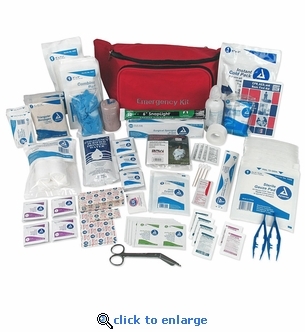 This kit Exceeds ANSI Standard Z308.1.2009 (workplace minimum first aid supplies category). 1 Abdominal Pads Sterile 8" x 7 ½"
1 Blood stopping Compression Bandage 9" x 5 ½"
5 X-Large Fabric Knee Bandage 2" x 4 ½"
15 Fabric Bandage 1" x 3"
1 Cloth Adhesive Tape 1" x 10yds. 1 Lister Bandage Shears 5 ½"
1 Tongue Depressors Sterile 6"
4 Cotton Tip Applicators 3"
1 Packaged in a Heavy Duty 3-Pocket "Hip-Pack"
Does your "Hip-Pack" Trauma Medical Kit include expired items? Instead of having to buy a whole new kit, save money and purchase one of our Refresh Kits to bring your kit back up to date.